In May 2018 the General Data Protection Regulation (GDPR) came into effect and governs the way the Society is allowed to communicate with members. A full explanation is given in the Data Privacy Notice further down this page. In order to ensure that you receive details of meetings and events, and to enable administration of your membership, the Society needs to know how you would like to stay in touch and is also required to obtain your consent. Let us know how you prefer to hear from us by completing and signing a consent form (download PDF here). Completed forms can be submitted at monthly meetings or to any committee member. 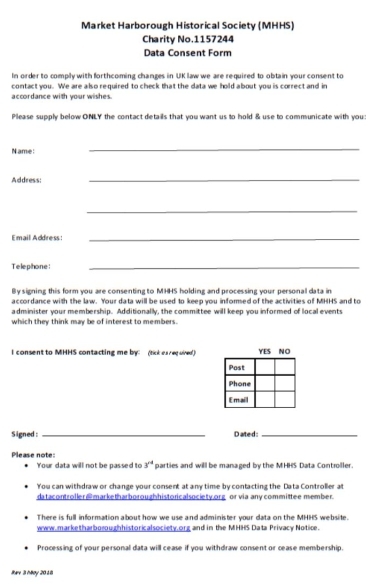 Alternatively, send completed forms to the MHHS Data Controller - obtain postal address from datacontroller@marketharboroughhistoricalsociety.org who can answer data queries and attend to amendments. Personal data relates to a living individual who can be identified from that data. Identification can be by the information alone or in conjunction with any other information in the Data Controller’s possession or likely to come into such possession. The processing of personal data is governed by the General Data Protection Regulations (GDPR). MHHS objective is to promote Market Harborough local history as defined in our constitution at www.marketharboroughhistoricalsociety.org/constitution.html The Data Controller manages how your personal data is processed and for what purpose. Explicit consent by way of a signed Consent Form, in order to enable membership administration and keep members informed of news, events and activities. Your personal data will be treated as strictly confidential and will not be shared with other organisations or 3rd parties. Processing and retention of your personal data will cease if you withdraw consent or cease membership. •The right to receive a copy on request of the personal data that MHHS holds about you. •The right to require that MHHS corrects any personal data which is inaccurate or out of date. •The right to withdraw your consent to the processing at any time. •The right to have your personal data removed from MHHS records. For any future purpose not authorised by your current Consent Form, MHHS will provide you with a new notice explaining this new use, and seek your consent to the new processing. To exercise all GDPR rights or submit queries please contact the Data Controller at datacontroller@marketharboroughhistoricalsociety.org or any MHHS committee member.